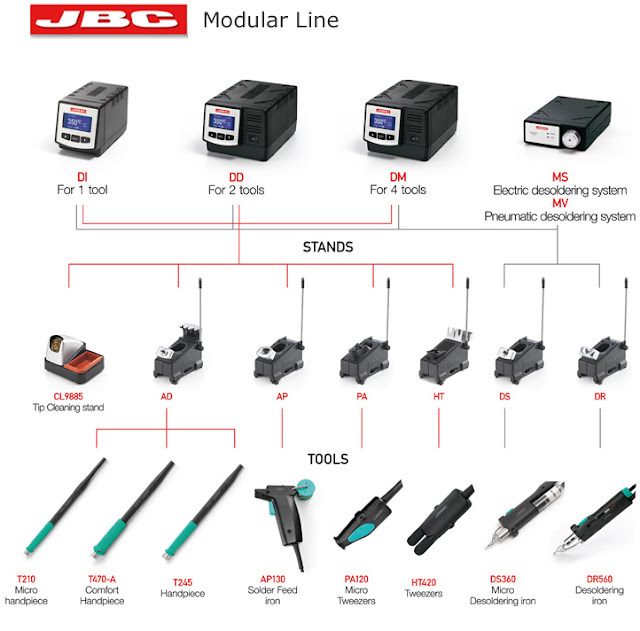 JanelOnline.com: JBC Modular Line "Build Your Own"
JBC Modular Line "Build Your Own"
We get a lot of questions about what tools, stands, and tips accompany JBC's modular line. Thanks to JBC Tools new website, we have found this really handy sheet which might answer many of your questions. As an update, JBC has also renamed one of their stands. The AD-SA or AD-SB (known as both) has now been changed to the AD-SC. Nothing has been changed drastically, so if you buy say, the T470-A handpiece (also fairly new) it will still work with the AD-SA or AD-SB stands. For one more side note regarding the T470-A, this item has also replaced the T245-TA or T245-CA (known as both). We hope this helps! If you have any additional questions, please give us a call or shoot us an email.